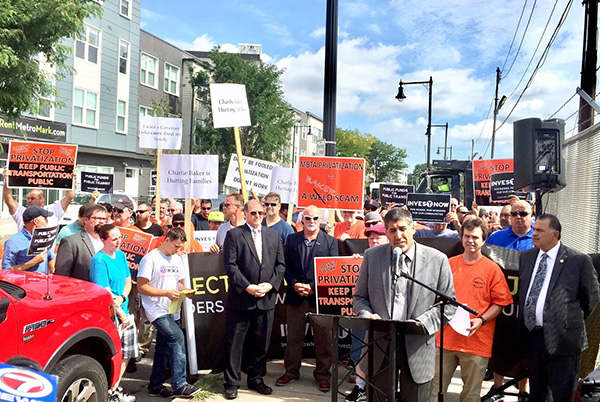 A long, difficult fight for the Machinists of IAM Local 264 ended in a victory for the working families of the Massachusetts Bay Transportation Authority (MBTA) and the communities they serve. On Sunday, Local 264 voted overwhelmingly to accept a new four-year deal that not only protects current work to provide maintenance, but also maintains a minimum fleet size. The new accord features wage increases in three of the four years, while increasing the length of paid bereavement leave for members. Negotiators also maintained the current defined-benefit pension plan and retiree health care benefits. For the better part of two years, the Machinists, along with labor and political allies, have been beating back an attack to privatize MBTA bus maintenance to for-profit, out-of-state companies. Despite state politicians’ repeated failures to reinvest in maintenance garage infrastructure, nearly 450 mechanics, fuelers and other skilled professionals in IAM Local 264 ranked as the No. 1 bus maintenance workforce in the U.S. for miles between breakdowns. As Massachusetts Gov. Charlie Baker pushed for privatization, the Machinists offered $29 million in savings to the state. It was this ideology that not only protracted the process, but inspired Local 264 to negotiate “triggers” in the new deal to protect the work—and workers against unnecessary future outsourcing.